Last year YESS was approached by a brand new organization called Level Up Gaming League. They wanted to share their love of tabletop gaming and all its fun and benefits with our youth. They were connected with the youth at Shanoa’s Place for their very first Dungeons & Dragons campaign with YESS youth! 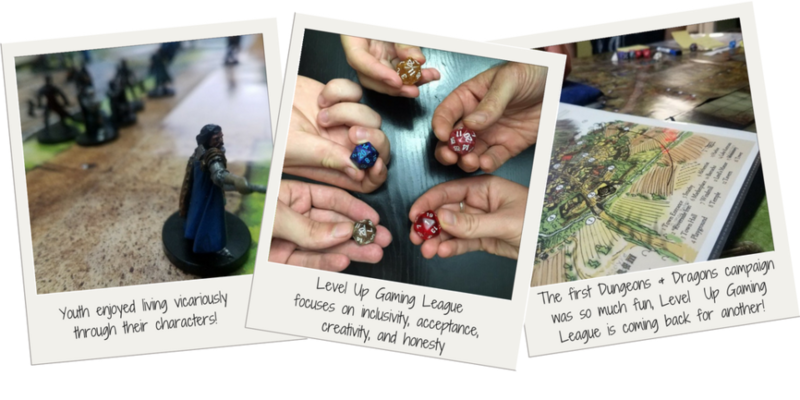 Level Up Gaming League believes that tabletop gaming has the power to create positive change in our community, and that by harnessing the power of gaming people can be empowered to build better futures for themselves. They provide gaming opportunities for organizations that support at-risk populations. With the groups they work with they encourage the social development of youth and adults through intentional gaming and build a culture of inclusivity, acceptance, creativity, and honesty. The campaign at Shanoa’s Place took about four months to complete, with sessions held every second week. A few youth were really engaged from the beginning, and a few more participated here and there. All of the youth who participated enjoyed this new and creative experience. YESS Youth Worker Dolphin noticed a number of new skills the campaign got our youth to practice. Dungeons & Dragons proved to be a powerful tool for teaching the link between choices and consequences. Challenges and riddles were opportunities for the players to cooperate and collaborate on solutions. And for an age group that’s used to the immediacy of video games, the switch to tabletop taught players to be patient. The team from Level Up Gaming League is currently kicking off their second Dungeons & Dragons campaign with YESS youth! This summer they’ll also host tabletop gaming days at our Armoury Resource Centre for youth in our daytime program. Let’s get rolling! Learn more about Level Up Gaming League! Nice work, Bryan! A brilliant initiative that is definitely a “level up” from so many programs that are simply a means of babysitting youth who so desperately need a way to develop the tools to explore what their own minds have to offer them!